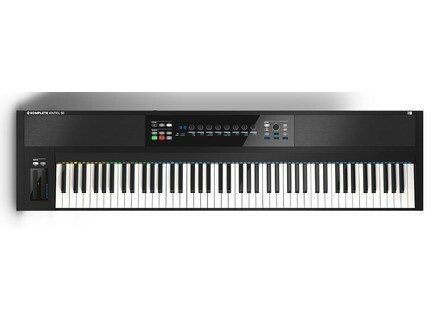 Komplete Kontrol S88, 88-Key MIDI Keyboard from Native Instruments in the Komplete Kontrol S series. Product replaced by the Native Instruments Komplete Kontrol S88 mk2. Native Instruments today released a number of new advancements to their Komplete Kontrol product family. Version 1.5 of the Komplete Kontrol software adds the new Native Kontrol Standard, as well as VST support, and comes as a free update. To mark this new level of integration, Native Instruments have partnered with Arturia to offer special pricing on the V Collection – their bundle of 13 classic vintage synths now updated as NKS plug-ins. Until November 15, 2015, The Arturia V Collection is exclusively available at the NI Online Shop for $199 / €199 / ¥24,500 / £144 / AU$ 269. The flagship, 88-note hammer-action Komplete Kontrol S88 is also now available online and in retailers worldwide for $999 / €999 / £729 / ¥119800 / AU$ 1399. Until November 15, 2015, The Arturia V Collection is exclusively available at the NI Online Shop for $199 / €199 / ¥24,500 / £144 / AU$ 269. Zynaptiq releases Unmix::Drums Zynaptiq has released Unmix::Drums, their new source separation-based plug-in for controlling the level of drums in mixed music. Tru-Urban Pro Guitar 2 Tru-Urban releases version 2 of its Urban-Pro Guitar electric guitar licks soundbank. Amazing Machines AM102 Amazing Machines presents its AM102 Programmable Wavetable Oscillator for Reaktor, featuring a 16 Stages Wavetable.